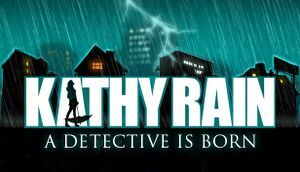 The saved games from the Demo version of Kathy Rain are not interchangeable with the saves of the full game. Pixel-perfect 320x240. Scaling algorithm is nearest-neighbor. Set via <path-to-game>\winsetup.exe or see Windowed. Use this method to force windowed mode. Game can be played in different sized windows. Mouse cursor is not restricted to the game window and can move into the desktop. Open acsetup.cfg with a text editor. Change the line windowed=0 to windowed=1. This will launch the game in windowed mode. Now change the line gfxfilter=max to gfxfilter=StdScaleX, where X is a multiplier of the original 320x240. Example: Setting gfxfilter=StdScale2 will launch the game in a 640x480 window. This will limit the size of the window so it won't be larger than your screen. Master, Speech and Music volumes. 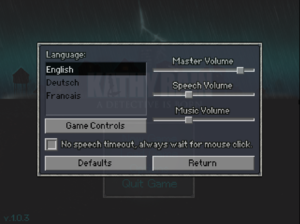 All dialogue throughout the game includes voice and text by default. Fan translation by «Prometheus Project» for version 1.0.3 [GOG]. ↑ 2.0 2.1 File/folder structure within this directory reflects the path(s) listed for Windows and/or Steam game data (use Wine regedit to access Windows registry paths). Games with Steam Cloud support may store data in ~/.steam/steam/userdata/<user-id>/370910/ in addition to or instead of this directory. The app ID (370910) may differ in some cases. Treat backslashes as forward slashes. See the glossary page for details.